In December 2007, United Utilities completed the disposal of United Utilities Electricity. Following the disposal, United Utilities returned the net equity proceeds of the sale to their share holders. Approximately £1.5 billion equivalent to 170p per share was returned to shareholders in total. one B-Share for each United Utilities plc Shares held as at 25 July 2008.
receive a single dividend of 170p. The new company, United Utilities Group plc commenced trading on 28 July 2008, this is deemed to be the effective date of the share reorganisation for tax purposes. The B Shares were not listed on the London Stock Exchange. For the purposes of the UK taxation of chargeable gains, the cancellation of the United Utilities Shares and the issue of United Utilities Group Ordinary Shares and B Shares is treated as a reorganisation of share capital. Accordingly, Shareholders are not treated as making a disposal in respect of the cancellation of United Utilities Shares or an acquisition in respect of the issue of the United Utilities Group Ordinary Shares and B Shares. For the purposes of calculating chargeable gains, the United Utilities Group Ordinary Shares and B Shares are treated as having been acquired at the same time and for the same consideration as the original United Utilities plc Shares. In addition, the sale on behalf of Shareholders of fractional entitlements to United Utilities Group Ordinary Shares resulting from the scheme, does not constitute a disposal by UK resident Shareholders. The amounts of any fractional payments received by Shareholders from the sale of fractional entitlements to United Utilities Group Ordinary Shares should be deducted from the base cost of any United Utilities Group Ordinary Shares and B Shares received. The original base cost (less amounts received on sale of any fractional entitlements, as referred to above) of the United Utilities plc Shares is attributed to both the United Utilities Group Ordinary Shares and the B Shares in proportion to the respective market values on the first day that the new United Utilities Group Shares are listed on the Official List. 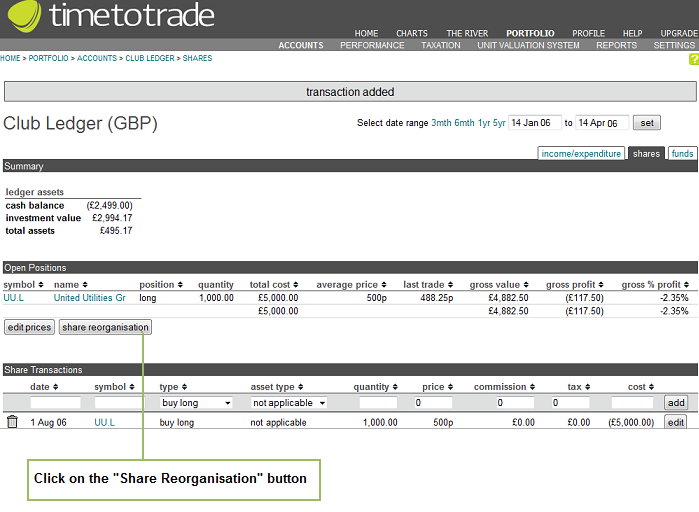 Alternatively, you can use the timetotrade Share Reorganisation Wizard. 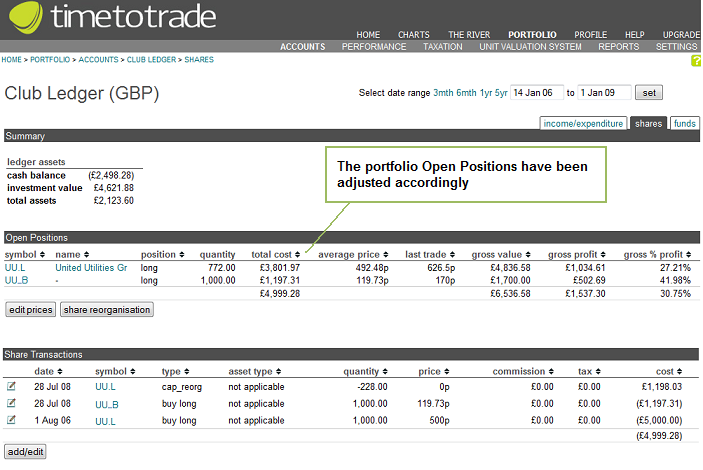 The Share Reorganisation Wizard is included free as part of the timetotrade's basic portfolio tools. In this example we are saying we purchased 1000 shares in United Utilities plc (symbol UU.L) on 1st August 2006, at 500p per share. For the purposes of this illustration only, we will assume no commission or stamp duty was paid. timetotrade provides share price data from multiple exchanges; in order to identify shares listed on the London Stock Exchange use the Reuters format with the suffix ".L" after the EPIC. 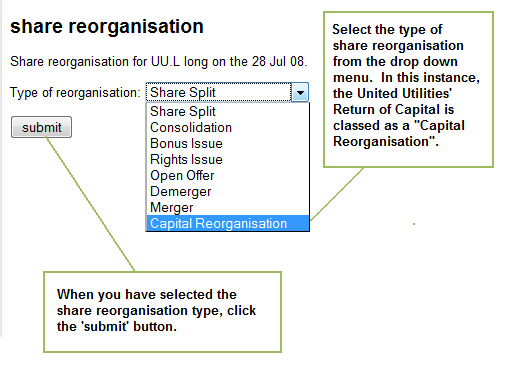 In this example "UU.L"
To access the Share Reorganisation Wizard, click the "Share Reorganisation" button, as shown in the screen shot below. This takes you through to the Share Reorganisation page. 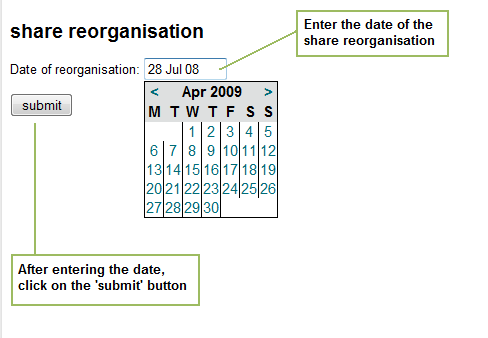 Step 1: Input the Date of the Share Reorganisation and click "submit". You can find this information in the Circular and Prospectus. For United Utilities' Capital Reorganisation, the effective tax date is given as 28 July 2008. 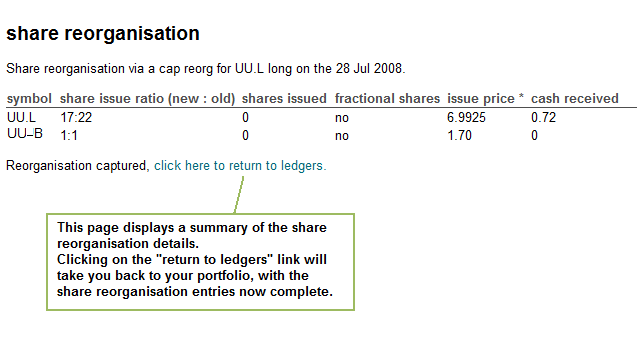 Step 2: Select the company from your portfolio to which the share reorganisation is to apply, in this case select UU.L from the drop down menu. 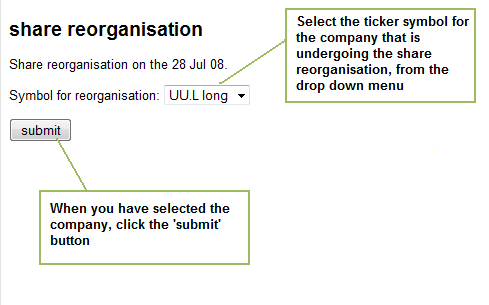 Step 3: Select the type of share reorganisation the company is subject to. In this instance United Utilities underwent a Capital Reorganisation, so select "Capital Reorganisation" from the drop down menu. Secondly an issue of one B-Share for each United Utilities plc Shares held as at 25 July 2008. Issue Price = this is the market values of the United Utilities Group Ordinary Shares on the first day that the United Utilities Group Shares are listed on the Official List. The price is listed as being £6.9925 (input this figure in £pounds, rather than pence for UK stocks). Cash Received = Enter here the fractional cash payment received. In this example, we received a fractional cash payment of 72p. Again, the value entered here should be in £pounds not pence for UK stocks). Issue Price = you can find the issue price in the prospectus, it is listed as being £1.70 (input this figure in £pounds, rather than pence for UK stocks). 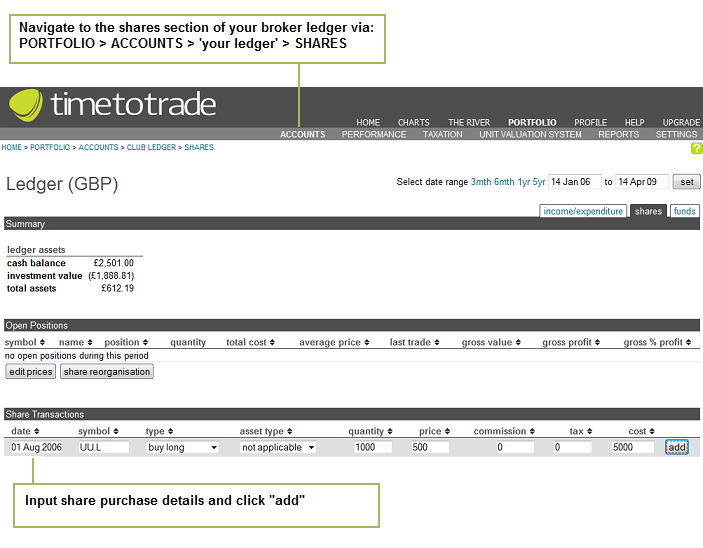 Cash Received = Leave this blank, as a 1:1 issue there is no fractional cash payment with the B-shares. Clicking on the "click here to return to ledgers" link will take you back to your portfolio ledger page. You can see that the share reorganisation has been successfully added with the basis costs appropriately adjusted for Capital Gains Tax purposes.